Gentry Academy is located on the Vadnais Sports Center campus in Vadnais Heights, Minnesota. Gentry Academy is housed in a 50,000-square-foot, state-of-the-art facility constructed in early 2017. It features four levels of space dedicated to holistic enrichment, including 22 active learning classrooms and learning labs. It also features a library and media center, student lounge, school store, full-service cafeteria with outdoor patio seating, conference room, office suites, nurses station, coaches corner, and a powerhaus gym and training facility. For the calendar school year, Gentry Academy will integrate a STEAM (science, technology, engineering, arts and math) Lab, donated by Gradient Financial Group, to inspire creativity and engage students for applied learning. 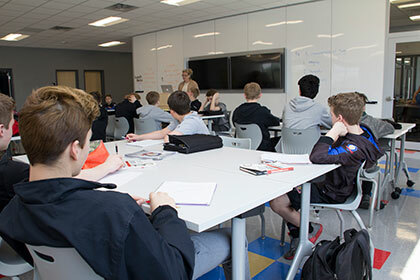 Classrooms are outfitted with Verb classroom furniture, an integrated collection of tables, whiteboards, and instructor stations that have been uniquely designed to support a diverse range of teaching and learning styles. 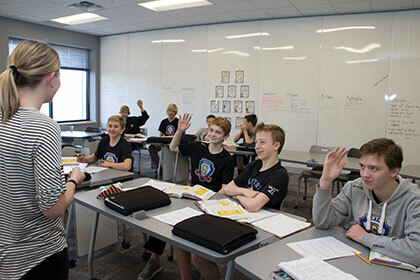 While traditional classrooms are designed to accommodate only one style of teaching and do not encourage student participation or engagement, our classrooms are specifically designed to foster an active learning environment. 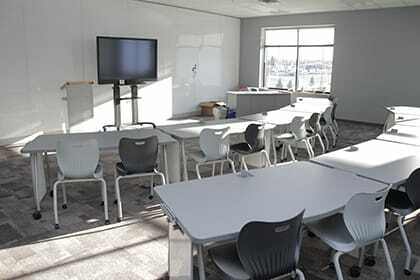 We utilize Verb classroom furniture to promote interaction and engagement between both students and teachers alike. Not only do the rolling school tables make it easy to transition between lecture, discussion and individual work, but they also encourage group projects and learning. The Verb whiteboard further enhances collaboration by making it easy for students to share and work with a team. Research shows that classroom furniture and tools can either help or hinder students' learning process, which is why we have created an environment that activates learning and motivates greatness at every level. Learning labs are spaces where students can apply the concepts of traditional subject matter. They have been uniquely designed to allow students to connect projects to their core classes and provide an environment that allows students to explore lab-related careers. Learning labs inspire entrepreneurship and encourage students to be creative and collaborate in areas across multiple disciplines. Learning labs further support the Gentry Academy philosophy of students discovering their strengths, pursing their passions, and creating a life-long path to success. New for the calendar school year, students will enjoy a modern STEAM (science, technology, engineering, arts and math) Lab donated by Gradient Financial Group. Through the donation, Gradient Financial Group hopes to offer a place where students can be creative, collaborate and explore related careers. 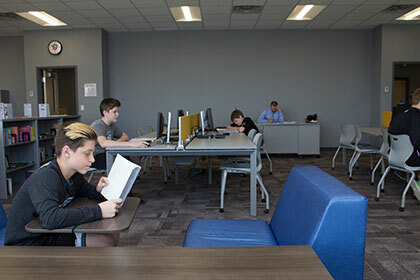 Boasting a 10,000-square-foot facility for wellness and athletic training, Gentry Academy allows students to strengthen the mind and body simultaneously. Moreover, the gym was designed with the intent to accelerate all qualities of athletes, including their energy systems. Student-athletes who focus on hockey also enjoy a synthetic ice shooting area modeled after top professional sports teams. Vadnais Sports Center is a state-of-the-art sports complex featuring two NHL regulation hockey rinks and a 100,000-square-foot sports dome. Gentry Academy is the proud owner of the naming rights for one of the 85' x 200' ice rinks. Two 85' x 200' side-by-side ice rinks are available at Vadnais Sports Center with spacious, modern locker rooms and seating up to 1,245 fans and 658 fans respectively. The sports dome consists of the full dome space, which can be separated into five individual fields, which is perfect for Gentry Academy lacrosse student-athletes. The ice rinks and sports dome makes the Vadnais Sports Center an ideal partner for all Gentry Academy practices and events. The Gentry Academy athletic programs that require off-site facilities will be provided through Gentry Academy's partnership with Midwest Gymnastics, Keller Golf Course, and other Ramsey County facilities. "Our progressive curriculum offers leadership and life skills training for all ages and creates unparalleled growth for our students. We are truly building tomorrow's leaders!" "Our unique mentoring approach to learning encourages older students to be actively involved in the development of their younger peers."